Safety equipment for air rifles can help you to enjoy your air rifle! The right safety equipmet for air rifles can mean the difference between having a great time shooting and an injury. It is especially important for new users to be protected. Air rifles are a great deal of fun but they have to be handled like any weapon. They are dangerous when not used correctly. Proper instruction in using the air rifle, storing the air rifle and cleaning it is a very important first step in the learning process. Of course the right safety equipment for air rifles should also be available for both novice and experienced users. One of the most prominent and painful air rifle injury is to the eyes. A good pair of goggles should be on your shopping list when you are considering safety equipment for air rifles. There are several really good options out there that are surprisingly inexpensive and that can protect your eyes from any stray debris or pellets. These are an excellent choice because they are flexible which means there is less of a chance of breakage. Crossman is a leader in the air rifle industry that takes pride in all of their products. These goggles are built to last. They are durable so you do not have to worry about taking them out into the field and dropping them. They are made to be used! These safety glasses are treated to prevent fogging, scratches and are vented to increase air flow. They offer a thick elastic headband to ensure that they stay in place. They are an economical option that are built to last. They are treated with a self-sealing material to seal over small scratches on the lenses. Your eyes are not the only thing that will feel the sting of air soft play. Your body would do well with a little protection as well. As part of your safety arsenal you can purchase a vest that will protect your torso from the sting of a pellet. This vest is well padded and completely adjustable. It offers thick foam padding that will easily prevent penetration of even the highest velocity pellets. It offers a customizable fit by adjusting the straps which makes it super comfortable to use. Comfort is always an important feature with safety equipment and this vest definitely can measure up in the comfort department. You can protect your entire face with a great face mask. These modified hockey goalie masks are efficient at ensuring your face is protected from pellets during air soft play and competitions. The helmets are also a great option. Usually you will have either one or the other but you can have both. This durable all ABS plastic helmet is ideal for protection during airsoft play. It offers a completely adjustable chin strap for a great custom fit. It is a great head protection option for airsoft play! This helmet is a little more high tech. It offers side rails where you can attach flashlight and other small gear to free up other storage areas on your body. It is an actual helmet used by the US military. It is fully padded and offers superior comfort and protection. 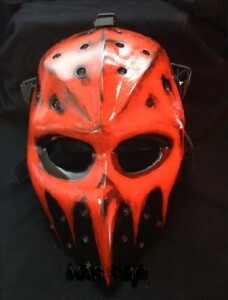 This is a one of a kind hand painted, made to order mask option. You will really stand out when wearing this. It is hand crafted by a sculptor with over 10 years of experience. This is a one of a kind custom fit mask. This would make an awesome gift! This full fiberglass mask is professional grade. Every mask is tested before it leaves the shop for durability and the ability to deflect pellet rounds. This is a great option because it is lightweight thanks to the fiberglass construction and it offers a great custom fit. This is a durable mask that is built to last. Every mask is tested before it is sent out for delivery to ensure durability and protection. It is a full face mask that has vent holes through out for great air flow. Safety equipment for air rifles are a must for the novice and a must for even the most experienced users. They ensure safe play without any injuries. They are well worth the small investment to protection your eyes, face, head and body. You can play safer and more confident when you have the right safety equipment for air rifles.